As many readers of my Blog will be aware, Lord Jack Ashley, champion of the cause of Thalidomide children during the 1970’s, and indeed for most of his political life, succumbed to a short illness and passed away surrounded by his family on the 20th April 2012. Following Lord Ashley’s passing, his family established a memorial website to enable those who wished, to post tributes to this great man. If you have not already done so, I would urge you to visit http://www.lordjackashley.co.uk and spend time reading the many wonderful comments which have been left by so many people. Some of those people knew Jack as a close friend, and family member. Some of the comments have been left by people whose lives were touched by the good work he did for so many disadvantaged members of society. I hope that after spending some time reading the tributes, you will feel able to leave a message of your own – so that Jack’s family will be buoyed by the support of the wider community at such a sad time. Over the last 24 hours, our national and regional news has been dominated by the names of some very high profile people from the world of sport and entertainment who have sadly left us. In whatever circumstances they left us, there is no doubt they left a legacy in their particular field that caused many people to use social media networks to pay their respects. So it was, when Jack Ashley passed away, I was moved to post a tribute to this truly great man – a man who, at a recent function, I described as “A Man For All People”. The full text of my personal tribute can be found on the memorial site. I hope you will find time to read it (amongst all the other tributes) on the site and appreciate fully the qualities of this extraordinary man. For Jack Ashley’s daughters, the need to pay their respects to a father, grandfather and much loved member of the family, will be evidenced in a memorial service which is to be held on 2nd July 2012 at the Assembly Rooms, Church House, (Deans Yard) Central London SW1P 3NZ, commencing at 12 noon. The service will highlight not only Jack’s position as a much loved member of the Ashley family, but will also celebrate his life – from those humble beginnings in Widnes, and ending in the corridors of power at Westminster (where he commanded so much admiration and respect). 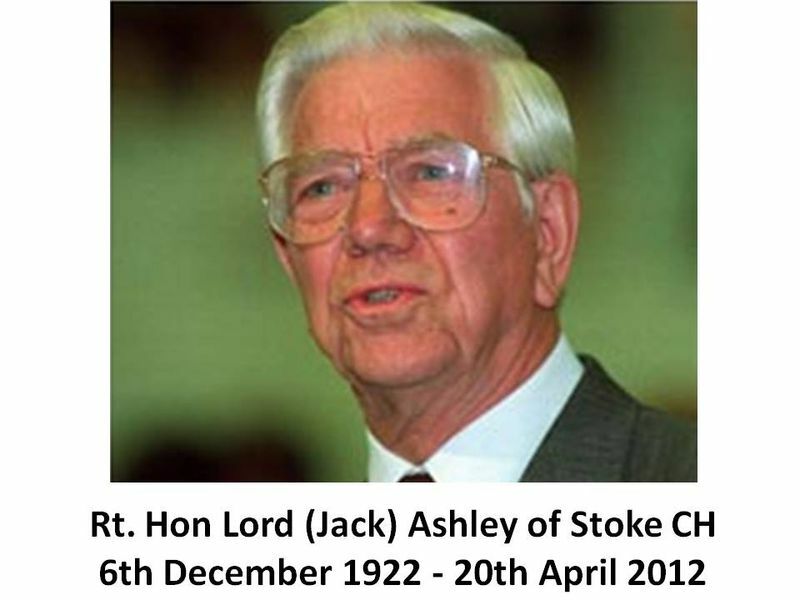 I am told the service will also recognise the enormous contribution which Jack (and his late wife Pauline) made to so many organisations, both nationally and, more regionally in Cheshire, and in his former Parliamentary constituency of Stoke. The service will celebrate a life through which Jack strived to make things better for all those around him. I shall be attending to pay my respects to Jack Ashley … to remember his tireless work for Thalidomide-impaired people and their families in Great Britain; to remember an outstanding parliamentarian; to remember a fierce and effective champion of disability and human rights. But above all, to remember a funny, kind and modest man.